There are a couple of times when President Jacob Zuma has knocked our breath clean out. When we’ve been appalled by a decision. When it’s plainly wrong, damaging to government and to us, the people. This is one of those times. On Wednesday Jimmy Manyi was appointed director-general of the government communication and information system (GCIS) and the SA government's chief spokesman. By STEPHEN GROOTES. Jimmy Manyi is clever, confident, and very, very astute. He understands communication, how it works, and is, generally speaking, pretty accessible. He’s one of those guys who, during a crisis, will answer his phone and, if he can’t speak about an issue, will be polite enough to tell you he can’t, before saying goodbye. His time as president of the Black Management Forum is proof he knows how to climb the political tree. He can manoeuvre factions, pacify enemies and run a politicised organisation. But he does not have credibility. It really is that simple. And it’s not just a media thing. Manyi first shot to prominence for his comments about affirmative action while chairman of the Employment Equity Commission. He had a talent for rubbing business up the wrong way. Having said that, that was his role and it was really his job to berate people for not implementing affirmative action. Then he went on to the BMF and became its president. It became a more active organisation under him. And let’s be frank here: It is a pressure group to further the ends of black managers. Again, fine. It’s not a racially-based organisation, or even a racist one (there is a world of difference there). It’s an organisation with, quite frankly, a legitimate purpose. The trouble really started when he became director-general of the labour ministry. It was obvious pretty quickly he did not get on with his minister Membathisi Mdladlana. 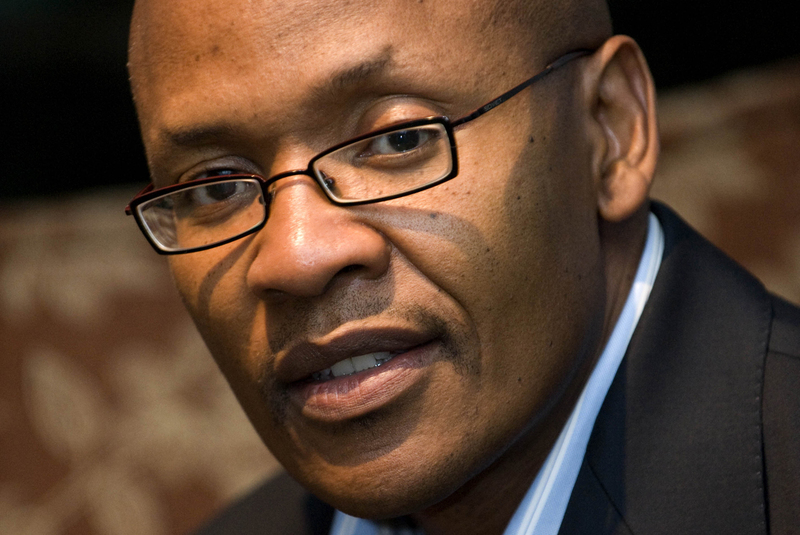 At the time Manyi faced many questions about his perceived partiality. It strikes us still that it is wrong to chair a pressure group directly involved in labour issues, and then to be government’s top official in the labour ministry. His answer to questions about whether he was compromised was a simple “No”. Under him, the BMF inserted itself in the Eskom crisis as a key ally to Julius Malema. On 30 April 2010, I wrote in The Daily Maverick: “What is disturbing though is that this organisation, by default the top representative of the business side of an entire new class, is not beyond moves to win short-term victories that can harm this country in the long-term. Manyi’s view that “freedom of expression has been taken a tad too far” in SA sounds all the more alarming now, as he assumes his new position. Eventually, and quite suddenly, it emerged Mdladlana had actually suspended Manyi, after a Norwegian diplomat said he’d tried to get a business deal for a friend during an official meeting. This is a man who used his government office to try to get some business for a mate with a foreign country. When Mdladlana lost his job in last year’s mammoth reshuffle, he had his own view on Manyi. And he said Manyi would no longer be DG because he was suspended during his period of probation. So it seems that when government talks of “redeploying directors-general” it may actually be legally incorrect. But no matter. The point is that Manyi hasn’t just lost his credibility with the media. He has been accused of something serious, and he hasn’t answered questions under oath about it. Instead, as is becoming so ordinary, it’s a case of political power meaning far more than right and wrong and due process. Manyi clearly has Zuma’s ear. And as a result he’s been given a plum job, as the face of cabinet. He joins that other paragon of virtue in GCIS, Vusi Mona. Remember, the man who decided to run the now completely debunked story that then national prosecutions boss Bulelani Ngcuka had been an apartheid spy – the claim that led to the Hefer Commission and all that followed. It was obvious then that Mona had lied and he admitted it with the entire country watching. But hell, what’s a little truth avoidance or two when it comes to communicating on behalf of the president. A word on the man Manyi is replacing, Themba Maseko, who is now going to run the public service and administration ministry (i.e. deal with public sector unions). I have not come across a more able, personable and honest communicator in government. Ever. No matter what the situation, he was able to keep his dignity and ensure government was on message. Not an easy task when you consider he started with Mbeki. He was always available and always well-prepared. During the Great Eskom Power Crisis of 2008, I found a four-year-old Green Paper predicting the power cuts, and warned Maseko he would bring it up during the next day’s press conference. When questions started, Maseko pointed me out first, smiled and said my name with a big laugh in his voice. He then looked down, and read off verbatim a lengthy comprehensive answer that seemed to cover all his bases. He told me later he’d spent an hour on the phone with the relevant minister on that answer. Most of us see our politics through a prism, the prism of the media. If that prism is broken, slanted or just not transparent, the whole system breaks down. Manyi does not have a good relationship with this prism. In short, if he were to phone up an experienced political reporter at 2am with earth-shattering news, that reporter may feel they would need a second source. If that happened with Maseko, it would be published instantly. At some point there will be some big crisis in government. That is the nature of all governments and governance in general. At that moment, how it is communicated, who does the actual communicating and the message itself will be crucial to whether that crisis will have a happy ending. Because of this decision, Zuma and government in general, could find they’re fighting public perceptions with one hand tied behind their backs. Grootes is an EWN reporter. Photo of Mr Manyi by Paul Botes, courtesy of Mail and Guardian.